Upgrades a 8088 IBM PC to a 80286-8 MHz system. A cable connects the card to the original 8088 socket (original CPU has to be removed). Features a Normal/Turbo switch on side panel. Dated 8651. Serial and parallel interface, Real Time clock (w. backup battery), 256 Kb of 150 ns RAM (may be expanded to 384 Kb using a daughtercard which can be seen on the left). Dated 52-85. 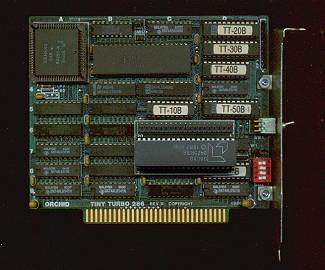 Features 2 Mb of 80ns RAM (8 x 256 Kb 30-pin modules). Dated 9026. Crystal CS4231A-KL audio chip, 14,400 baud modem, joystick and CD-ROM I/F. FCC ID: EUD5U9BRI4545. Dated 21 95.